The property is an amazing replication of the small fishing village on the Italian Riviera coastline. I actually feel like I'm in Portofino Italy! 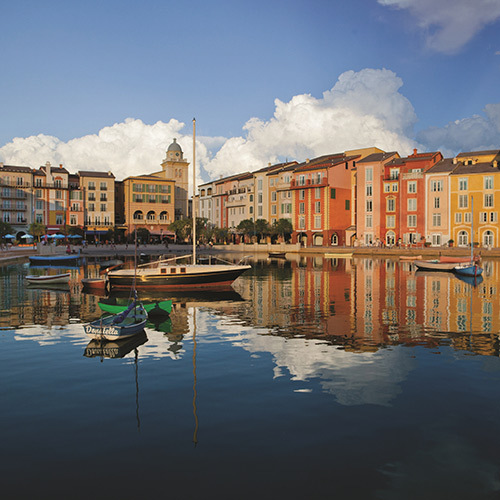 Resembling a small town on the Italian Riviera, the hotel features a small bay, gardens, piazzas and multiple pools. Luxurious, custom furnishings and marble accents create cozy, inviting rooms. Don't miss out on a leisurely boat ride to CityWalk where you can shop, dine and enjoy attractions. Multiple dining options as well as a state-of-the-art fitness center are also available on site. Take a relaxing break with a fabulous spa treatment while you're here, you've earned it! Smoke free premises. 750 units, some two bedrooms. 6 stories, interior corridors. I-4 exit 74B westbound; exit 75A eastbound, 1 mi n. 5601 Universal Blvd 32819. 9 restaurants, also, Bice Ristorante, see separate listing, full bar, entertainment. sauna, hot tub, steamroom, cabanas, recreation programs, kids club, playground, game room, trails, health club, spa. valet laundry, boarding pass kiosk, rental car service, room service, child care, area transportation-The Universal campus.